It’s been a while since I’ve see a Nokia device with a portrait sliding QWERTY form factor… let alone one with a touchscreen display and a keyboard of this type. 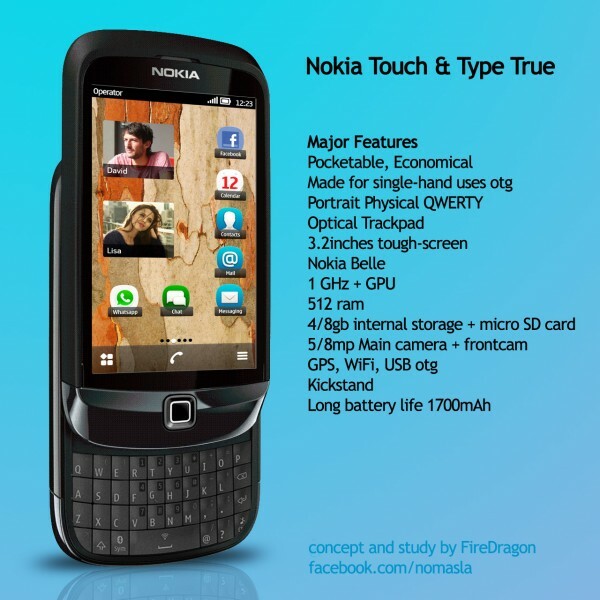 Meet the Nokia Touch & Type True concept, created by FireDragon and published on Mynokiablog.com. The handset is supposedly from the C2-06 range and it comes with a main home button below the display. This dream Nokia is pocketable, user-friendly, made for single hand use, it has an optical trackpad and a 3.2 inch touchscreen display. The phone runs Nokia Belle on top of a 1GHz processor, 512MB of RAM and 4 or 8 GB of internal storage, plus a microSD card slot. A 5/8 megapixel camera is on board, as well as a front cam, for videocalling. And finally, the Nokia Touch & Type slider comes with GPS, WiFi, USB otg, a kickstand and a 1700 mAh battery, that should provide a long time of functioning. Know that the camera on this device is able to scan a business card with readable content and the main appeal of the phone you see here is the ability to type very fast on its portrait QWERTY keyboard. The designer dismisses landscape sliders, finding them annoying and disturbing when traveling and during meetings.